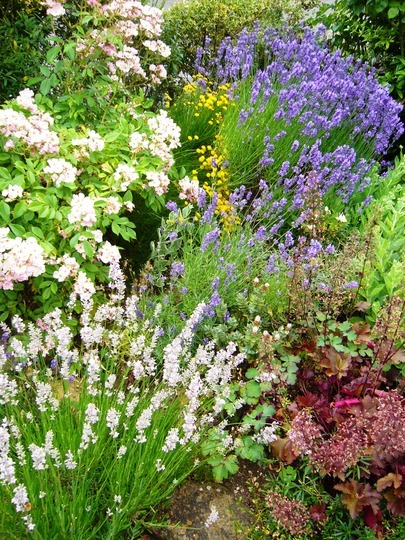 My front garden in July 2010. What a lovely selection of plants and they look so nice together. Beautiful varieties together making a wonderful display. What a mass of lovely colours -. where on earth do you find space to put your feet when you and your boys are busy with your watering cans ??? !!! looks like an artist's pallete - are you a painter Terra? There are some flat rocks amongst the plants where feet can stand safely ! Hello Richard... I have done some painting in the past, but nature seems to do a great job of making garden colours look good together ! What a stunning display TT....love it. Looks so colourful Terra and bet it smells lovely too. Spoiling your postman again! Gorgeous. Thanks Bornagain... I'm sure your lavender will look wonderful.. I am getting some great lessons in colour & structural combinations by just looking at your garden. This is lovely. The plants often surprise me by mingling together better than I had expected... Lol.